Electricity is supplied to your home via a service cable which is terminated into a chamber that contains a fuse. This fuse protects the complete installation and is the responsibility of the electricity supplier. 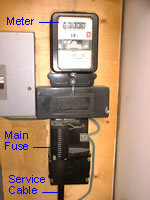 The meter is fed from this fuse, this can be integral as shown below or with visible cables. In older properties these cables would be red and black, in newer properties these cables have an additional grey sheath to protect them. Everything after the meter is the responsibility of the consumer, including the cables from the meter to the consumer unit. The consumer unit is the main part of the consumers electrical system, from here all the individual circuits are fed and protected by a fuse or MCB (miniature circuit breaker). The consumer unit also incorporates a main switch where the entire electrical supply can be isolated. Double insulated Description and symbol for double insulated appliances. Ingress protection Learn what ingress protection means and the zones within a bathroom. Lamp types Find out what lamps are available for the home, understand the difference between incandescent and fluorescent lamps. One way lighting using junction box How to wire a one way lighting circuit using junction boxes. One way light switch using inline switching How to wire a one way light switch circuit using the in line switch method. One way lighting using loop in ceiling roses How to connect a one way lighting circuit using loop in ceiling roses. Part P Learn about the Part P regulations, follow the flow chart to see what it means to you, new cable colour identification. Part P guide See what you can and can't do within your home with our easy to follow part p guide. Rewireable fuses Safely identify and repair a blown rewireable fuse. Stripping flex Methods for stripping electrical flex. Two way light switches method 1 How to connect a two way lighting circuit using twin & earth cable. Two way light switches method 2 How to connect a two way lighting circuit using three core & earth cable. Wiring a plug How to connect a flex to a plug.